I've been wanting to upgrade my cafe for a while now and so over the last few months I've been purchasing some new goodies. Most are bought from various sellers on Ebay and are hand made items while others were bought from Etsy. 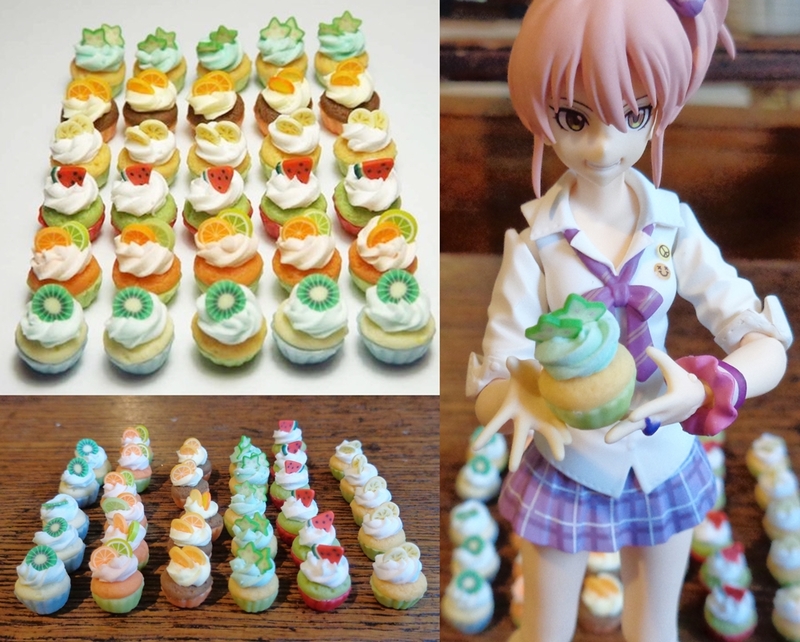 First up are some delicious looking cupcakes from a trader on Ebay. 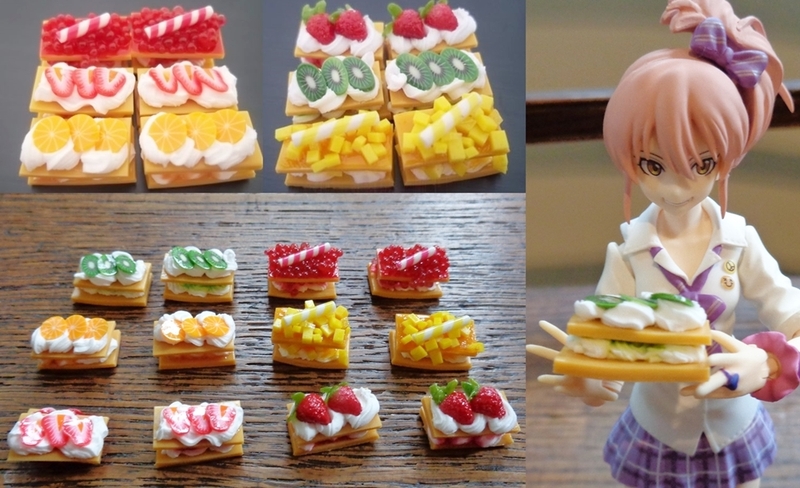 They are all hand made and look just as yummy as they do cute. 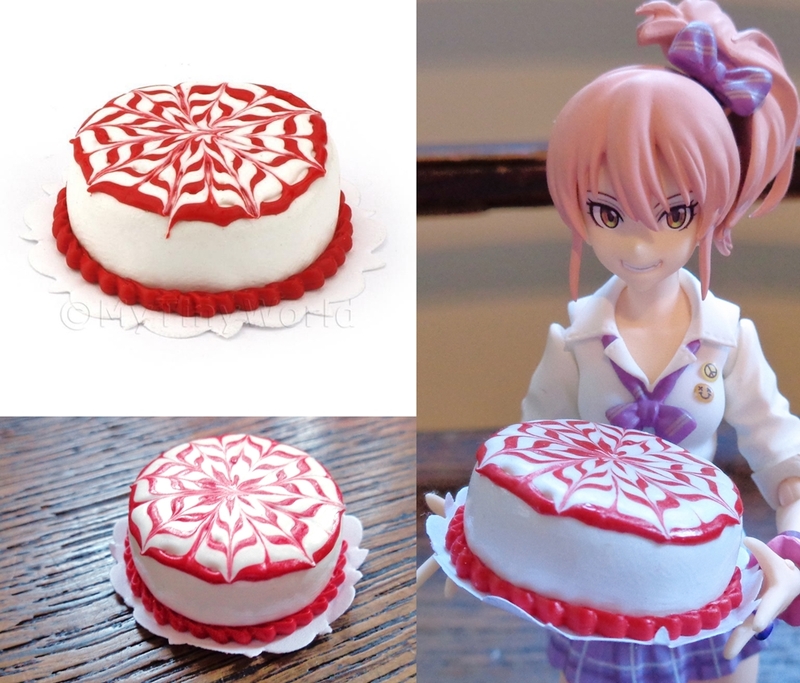 From the same seller I also purchased this amazing cake. If you wish to check out the sellers other listings click here. Next I got some medium sized pastry cakes. 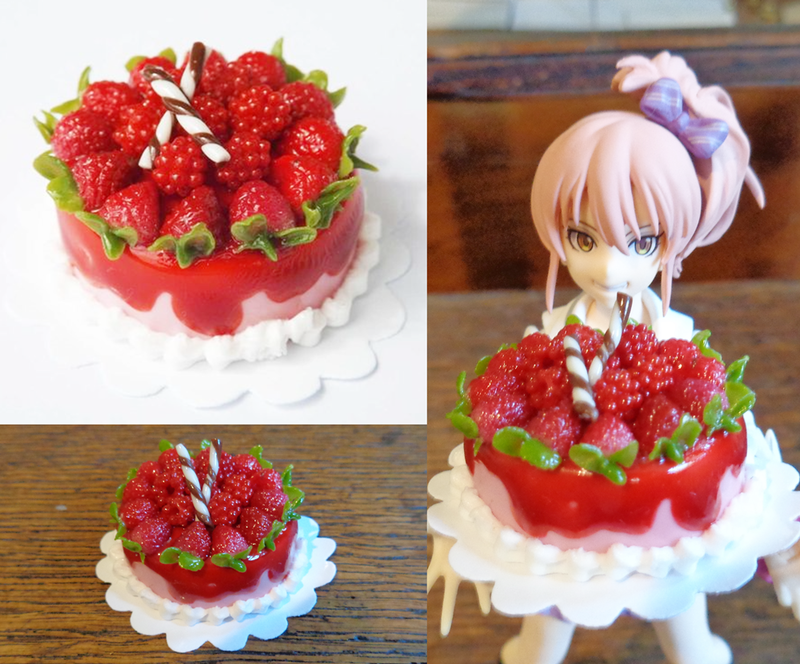 Once again hand made and unfortunately one of the strawberry ones was a bit squished out of shape, but this could have happened in transit and as I am rather crafty I took it apart and fixed it myself. Check out this sellers other listings here. I then got another cake, this delectable swirl number. I got this one in particular as I thought it would look nice along side my two none fruit topped pastry cakes. Now this cake is from a seller which I have used a lot as they sell the windows and doors I have used in my cafe. This seller has both an Ebay store and a Main store. For added decoration I picked up some slices to match those on the cupcakes and the pastry cakes. 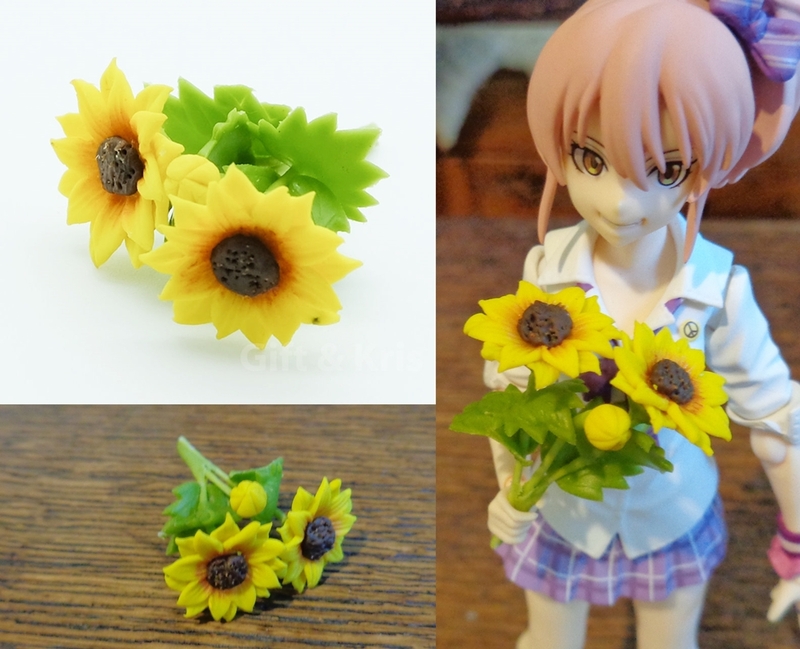 I ordered these from an Esty seller and you can find the listing here. 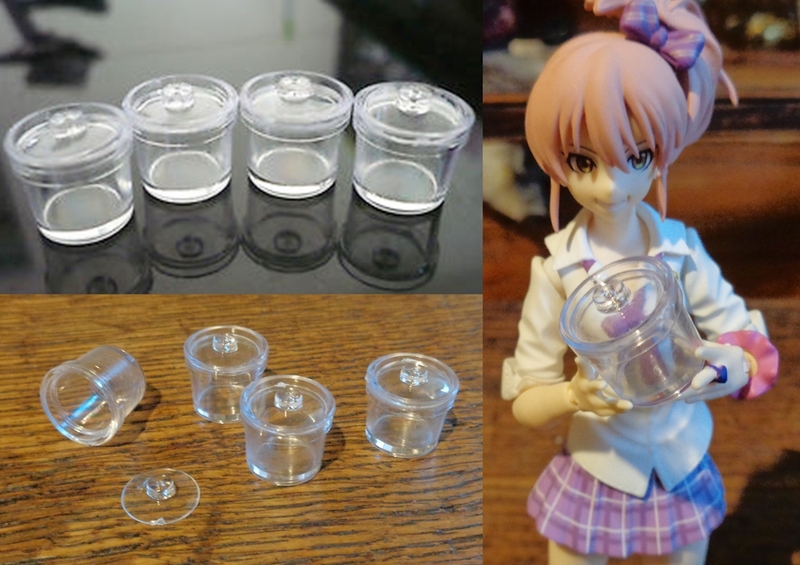 Another Etsy purchase were these cups, they are half handmade as they were filled with liquid by the seller. The seller sells a variety of colours and you can check them out here. Now there was a bit of a mix up with my order as the seller thought the purchase was for three cups when it in fact said four cups on the listing thus I was a bit confused when I got three orange and three green then two which were different colours (as a bonus). 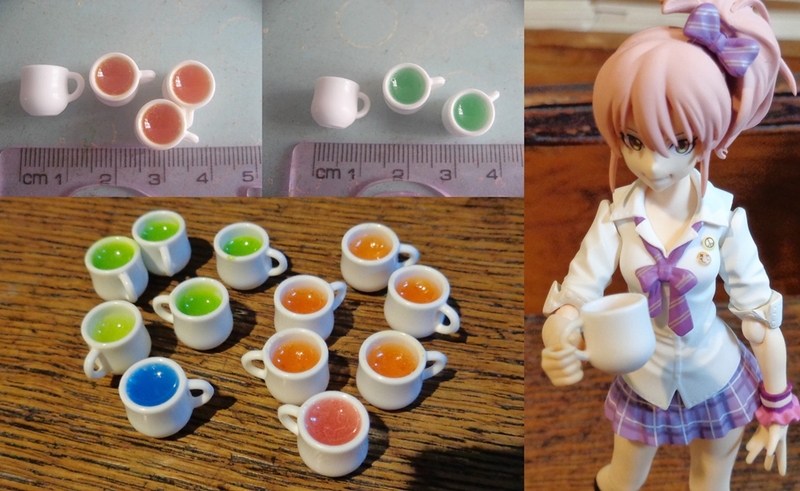 This was swiftly sorted however and I was sent two replacements for each colour so I ended up with ten cups instead of eight plus the two different coloured ones. So many cups! 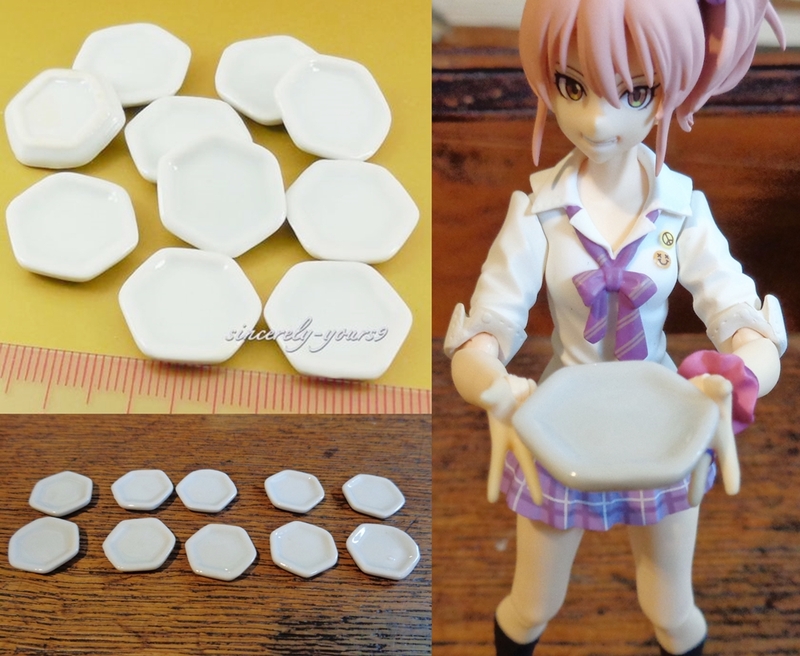 Once all the food and drink had been ordered I had to get some thing for them to be placed on and I was really taken with these little hexagonal plates and they were the perfect size for my cupcakes. They were however too small for the pastry cakes so I found these rectangular ones whose corners mimic the hexagonal design and they were bought from the same seller as the pastry cakes, thus they fit them perfectly. 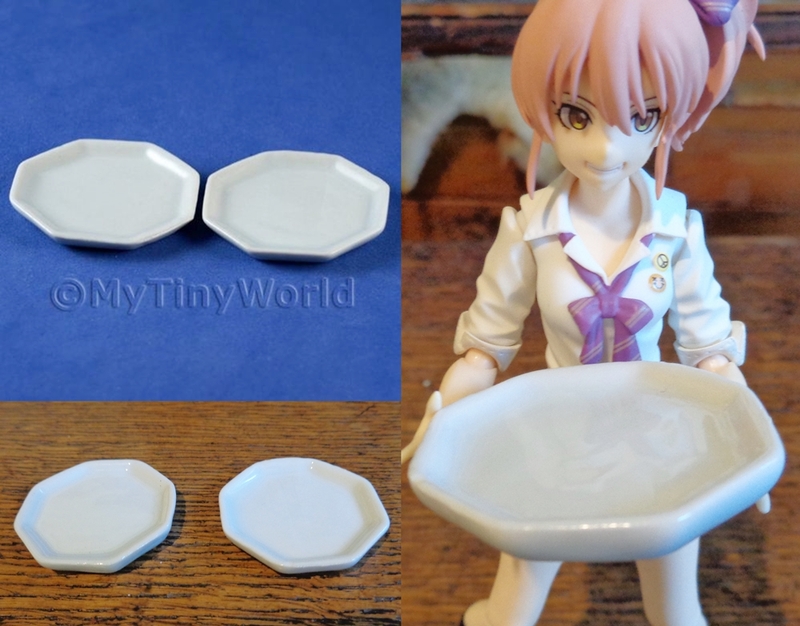 Next my cakes needed plates and again to match the small hexagonal ones I found these larger octagonal ones. 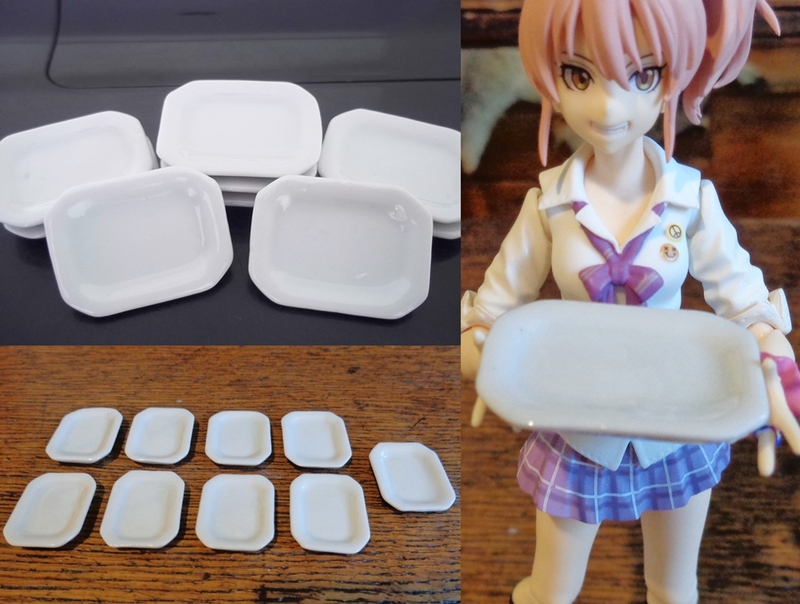 These plates are from the same seller as the swirl cake. For my fruit slices I purchased these small jars. You can find similar listings here. 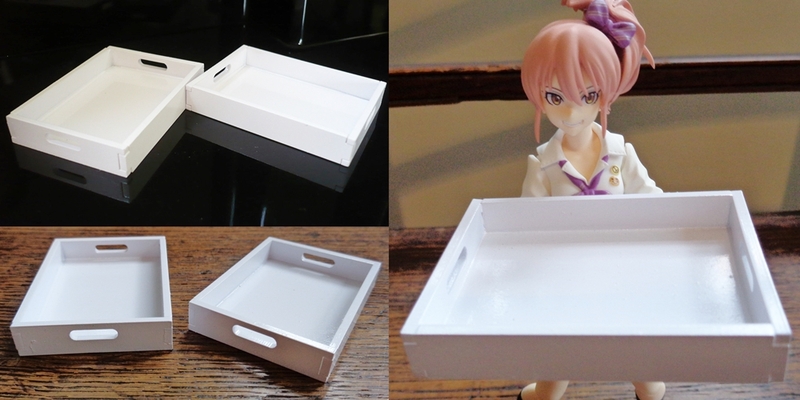 These trays were also bought from the above seller and will be just perfect for displaying my cupcakes. 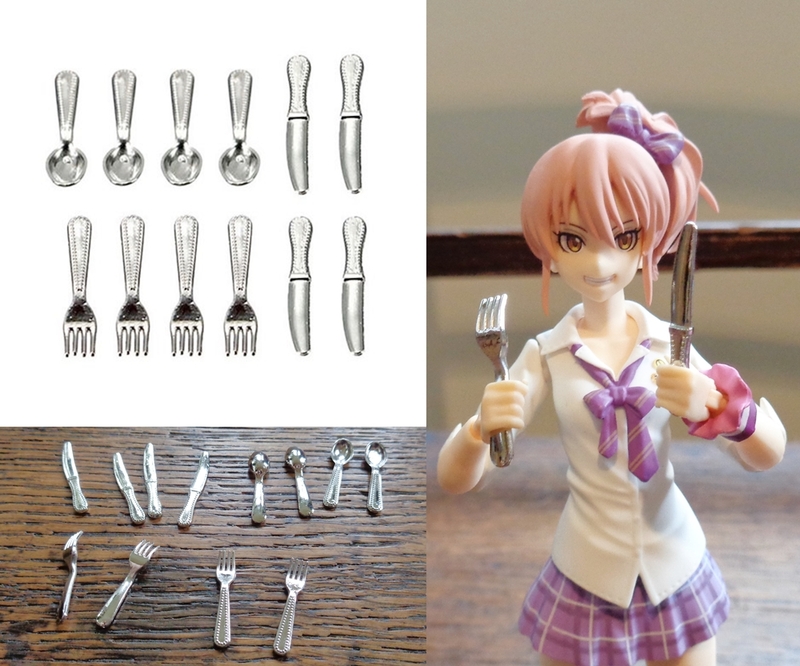 Then I picked up some cutlery from yet another Ebay seller. 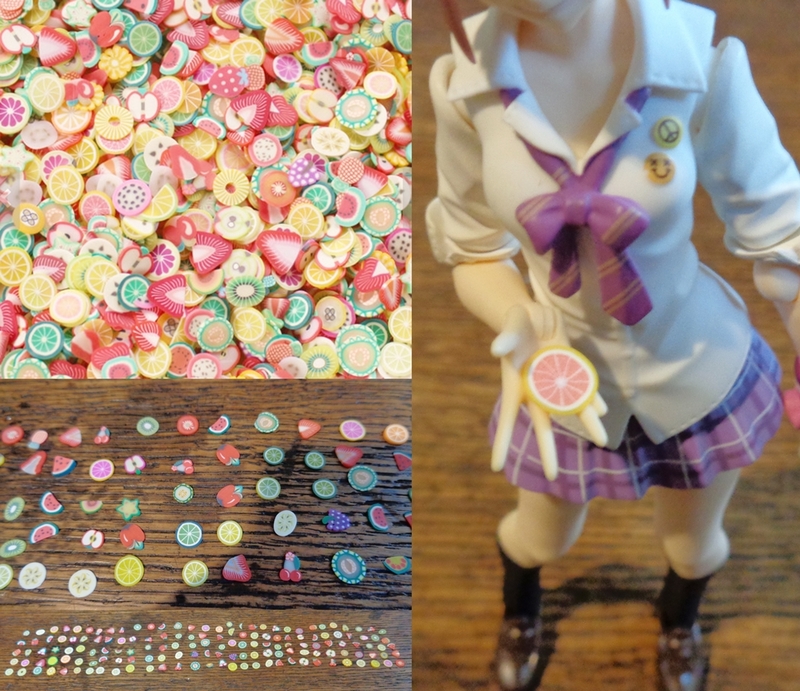 Now I actually bought two lots so I have double what is shown in below. In order to hold the cutlery I got these two jugs , one for each table. 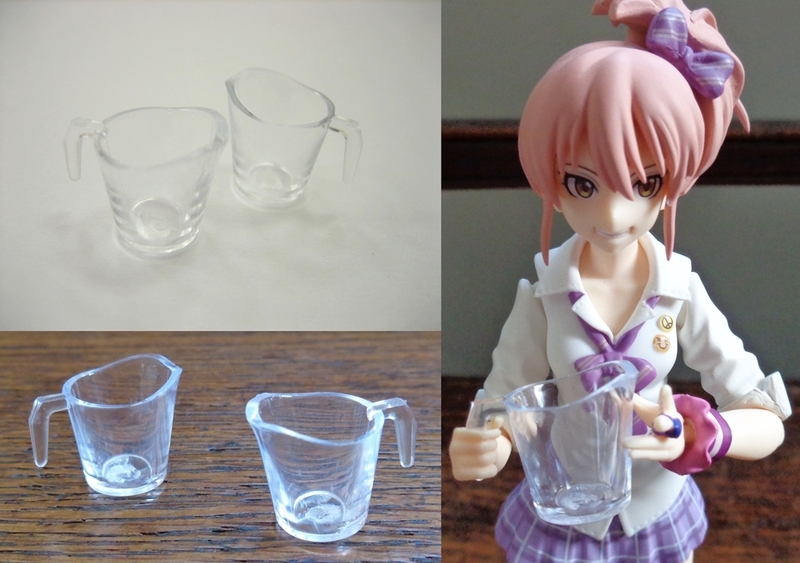 Why jugs you ask, well I plan on creating a somewhat rough and ready looking table top display. And to finish off I got this eftpos machine because you can't run a cafe without one (even though previously we have, as miniature cash registers are for some reason very pricey). It took several odd searches to find this style of register and at last I found one at this sellers shop. 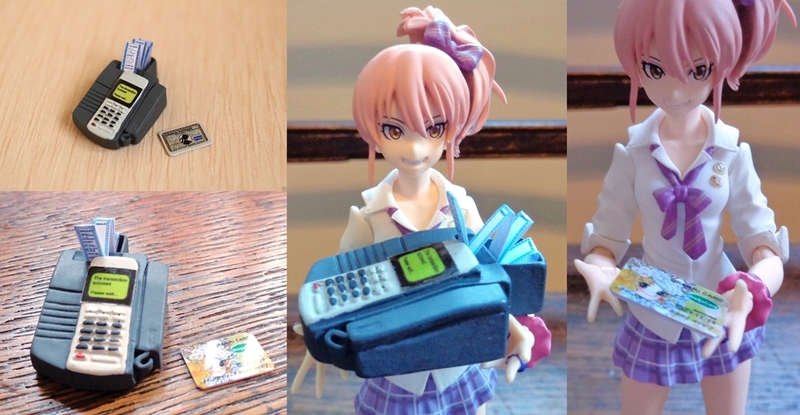 Now as you can see although the eftpos machine is a passable size for the figmas the credit card is not but this isn't that much of a problem as I can easily make my own with a printer and some cardboard. 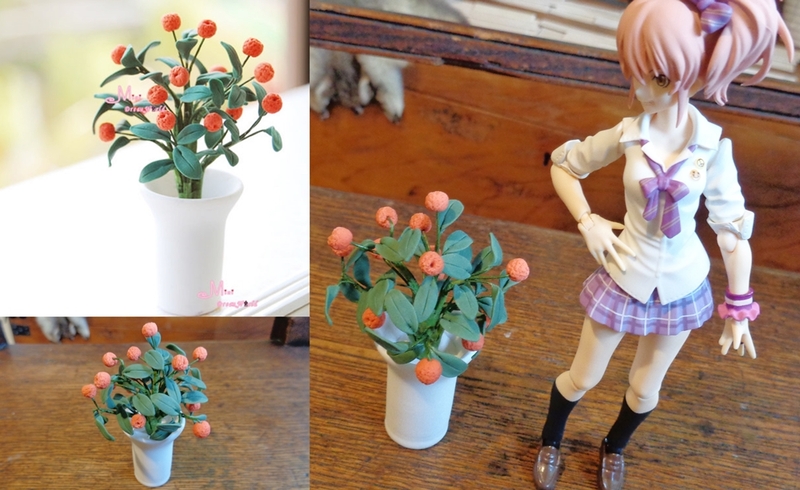 After all food related things were taken care of I turned my attention to furnishings picking up this cute little orange tree. Although the original image looks more spread out the branches are all wrapped wire so you can bend and shape the tree to your desired shape. You can check out the sellers store here. I thought it might also be good to have a little display of flowers on each table so I bought this bunch of sunflowers which I can then divide in two. If your interested in more flowers check out this sellers store. 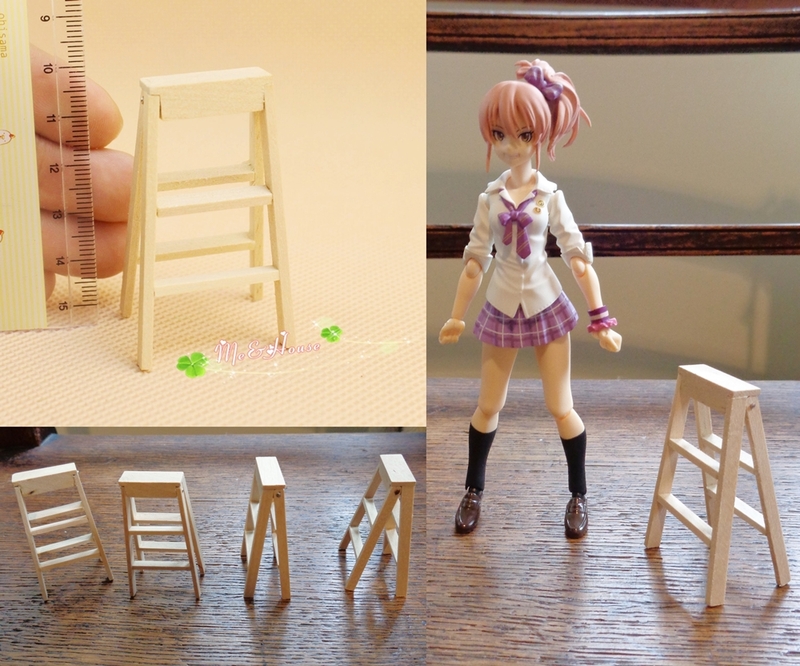 Now table and chairs always end up being overly expensive and hard to find in the correct scale for figmas so this time I decided to make my own and to aid me I got four of these ladders as they seemed to be a good height to make trestle tables with. Included in this package was a free gift which I think I can put to a good use. Check out this seller here.